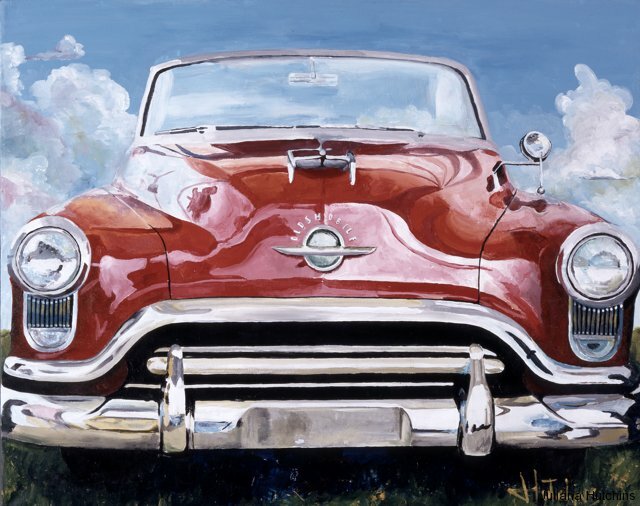 “Ride of My Dreams” was created after a trip to the Jackson-Barrett car show in Scottsdale AZ. The place was a sensory banquet of color, texture and people passionate about their cars! In this acrylic on deep canvas painting, I worked on integrating the cold hard steel and bright colors of the car with the environment around it…the metal becomes part of the sky, the chrome part of the grass and earth it sits on, all becoming one entity, merging into the other. numbered/signed glicee prints are also available- or, I could do the car of YOUR dreams! Maybe even with you and your “sweet thang” having a picnic in front of it? Email me and we’ll talk!